What exactly is "idea innovation software"? Well, you know how to think, right? But when was the last time you were able to come up with a brilliant idea and and actually execute it? Easier said than done, no? That's where idea innovation software steps in, to help you organize your thoughts, brainstorm, and come up with solutions that are way more innovative than anything you could think of yourself. And the most intuitive, most advanced idea innovation software is ThoughtOffice! ThoughtOffice helps you drill deep into any topic, aided by questions and answers provided by some of the world's brightest people. And when you come up with a particularly shiny, effective idea, ThoughtOffice lets you share that with the whole world in the form of outlines, storyboards, and blog posts, all attributed to you and protected by copyright! Plus, you can output your brainstorming session as text, PDF, outline, storyboard, or HTML. Organize your thoughts and brainstorm more efficiently. Come up with your own ideas by exploring fragments of ideas. Join nearly 400,000 thought leaders worldwide who are already using the application. Access thousands of questions provided by some of the world's brightest minds. Share your brainstorming session easily as an outline, storyboard, blog post, or web site. After you purchase ThoughtOffice Brainstorming Software it may be used indefinitely. ThoughtOffice Brainstorming Software is licensed per user, so if more people are going to use ThoughtOffice Brainstorming Software you will need to purchase additional copies. Each license allows installation on 3 computers, but ThoughtOffice Brainstorming Software may not be used at exactly the same time on each of them. Upgrades to future versions of the software will be free up to the next major version and minor versions thereafter. For versions after that, upgrades will require additional payment, which will be discounted by 35%. It will be discounted only if you've purchased the last major version. “Love the 60 second how-to videos. Great for an executive like me with limited time. Thank you for the great technical support. You guys rock! Thanks again!”- Mihelle H.
Mark Effinger Here's another video (from our home page) that tells a more direct, compelling story of how ThoughtOffice works. This tool looks interesting to me in order to research and develop content as well as a language assistant (since English is not my mother tongue). If I find it useful I'll promote it as affiliate as well. - What are the topics covered by this license. I mean, Which are the modules included. I'm specially interested in marketing. - What is the license model regarding maintenance and updates? Is it necessary to pay any yearly subscription or something? - I understand that I could include the images and the rest of the provided material into the articles developed using the software. Right? Thanks for the questions. We just got hammered with international orders, hence the delay in response. Let's see if we can handle that. ME: The factory modules are Expert Evaluator (evaluates an isue from all angles) and Expert Solutions (Professional problem-solving module). If you will PM me at me thoughtoffice.com, I will let you know what we can do regarding the Expert Marketer module. ME: All updates from the current version to v2.0 are free. v3.0 upgrade will be at 35% discount of the sale price. ME: Absolutely. We did a buy-out of a 2,000 image stock photo library. And any additional images you use can be added to the presentations provided by ThoughtOffice. Let me know if that clarifies things for you, Diego! What's the latest release of ThoughtOffice? Bought this on the 12th of may 2011. I have version 1.18, but can't find release notes about new versions. Today I bought two extra modules, but did not receive a download link. Thanks for connecting. I'll make sure you get the download links uno momento. You're on the most recent version. We'll be sending an update ping in short order as we get the Win-7 folder hierarchy and the Lion updater elements figured out. And let me also send you the updated content (2000 stock photos and some videos). You deserve it. what´s a good recommondation for the company and an argument for buying at this discounted price. 2. ability to choose additional idea-browser ressources (e.g. Mark Effinger Hi H. H.
Exceptional feedback (and thanks for the props as well). Yes, most of what you're suggesting are a part of v2.0 feature set. The randomization has never been considered. The way we arrived at the questions was to interview 217 industry experts (from every one of the 16 disciplines for which we have modules). We discovered they asked the questions in a specified order, in a natural 4-level hierarchy. Hence the current layout. That said: I like that idea. And I'm sure, since the modules are in flat-file databases, we could do that. I DEFINITELY like the idea of keeping the mind alive by reordering the content. Smart idea. LOVE #4. And I can have Eric create that as a stand-alone app. So watch for that in the coming weeks. As always, appreciate your insights (and we welcome any more). This is a significant year for ThoughtOffice, as we're expanding the application via "other ecosystems" like Evernote. We also have additional solutions coming to help you Get Smart. So keep your eyes peeled. William Hernandez I downloaded the demo, but when I start it up, it says that the demo has expired. This is the first time that I install this software. How do I get the demo to work? Mark Effinger Hi, William. Dave Lockman here for Mark. Sometimes, what you've described happens when a ThoughtOffice or eXpertSystem demo was installed earlier on the system. If - when you open the program - you click the "Close" button on the "nag screen", the program should start in demo mode. But it can also be related to an installation issue. If you hit "Close" and the program shuts down, please double check where the program is installed on your computer. For Windows, that's c:\Program Files\ThoughtOffice. On a Mac, the ThoughtOffice folder needs to be inside the Applications folder. If the program is installed to another folder, that can cause problems for the program. Let us know how it goes, William! William Hernandez Never mind, I was able to get the DEMO to work. What modules does it come with? Its a little confusing, at least on the DEMO, it only has a "Quickstart" option with limited topics. Is this sale limited? If you could list which complete modules modules come with this purchase and which extra modules are available at extra cost, that would clarify. Cool that you got past the splash screen on the demo mode. We will be updating that in the new update. http://www.thoughtrod.com...re-plugin/ below the Newsletter Signup form. Thanks for the inquiry. Let us know if you need anything else. K X Could anyone who has both ThoughtOffice and IdeaFisher Retro 7 comment a bit on how they compare? I read an old review of IdeaFisher and it said you can add your own questions. Is this true of the Retro 7 edition? I iike HH's ides, espcially: "1. ability to create user-defined modules." I'd like to see this happen. And "2. ability to choose additional idea-browser ressources (e.g. other search-engines.)" You could take a look at WordWeb Pro as an example of one such program which lets you add your own browser resource tabs. Mark Effinger Hi, KX. Dave Lockman here for Mark. IdeaFisher Retro7 is the very same program as the old IdeaFisher, but with a new run-time wrapper that allows it to run on Windows 7, compatibility mode. Any old features should be carried forward. As to HH's ideas, we've been working to implement both in upcoming versions of ThoughtOffice. Hope that answers the questions. Shout out if you want more info! Robert Chan I hope that the program can support unicode Chinese. Funny you should say Unicode: We do not currently support unicode/Kanji character sets. But we have one of the most prominent Unicode programmers on staff. He actually developed the unicode rendering engine for most popular browsers starting at AOL and moving to IE and Safari. So we'll put that on our list of ToDo items as we move forward. Thanks for the "a-Ha!" moment. Robert Chan I do not see the option to export a session to a pdf in the demo version. (It is mentioned in the help file) Is this feature only available in the registered version? I just downloaded 1.0.125 from this site (release date 2007) with no exmaples, have no idea how to use it. Is this your actual demo, no other more actual version / demo link ?? Mark Effinger Hi Robert - The demo can export as well. Here's the video that explains how to do so. 1) Clicking the Topics button (upper left) and exploring the Demo Module. 2) Add some Topical Content to your Session. 3) Either answer some questions or find "keywords" within the questions and setups that you want to explore. 4) Highlight those keywords and click the Ideas button. Now, explore the ideas and add your content back into the Brainstorming Session as you work (HINT: Clicking the Tracking checkbox in the IdeaBrowser will allow you to track each of the keywords as you brainstorm. You can also use it to backtrack later on). 5) Create and Save your Session. Then display, review, present or print/export. The videos on our ThoughtRod YouTube channel give some insights. And we're quickly creating new videos as we update the app. working fine now! Very impressive! One more question please, is my data and planning save? In session properties - Access List, if I don't define an Access Control List, does that mean my plans are flowing into your online data base or are spread over the net ? Morgan Schweers I downloaded the demo, and I can imagine it being useful in a few versions, presuming the limitations aren't fundamental to the technology stack it's built on. Right now it's too rough. There are two core problems; the user interface is clunky, and the application focuses on giving you lots of options instead of getting things done. Specifically when I say that the user interface is clunky, the 'next step' at any given moment is unclear (I had to poke around before I found that the 'Topics' button was the next step I _really_ needed to go to). A few other UI nits in the half an hour I tried to use it: using arrows to move between topic questions doesn't change the topic question, there doesn't seem to be a key to add the currently highlighted question to the session, double-clicking doesn't add the current question to the current session (so that button WAY far away from the questions is the only way to add them? ), you have to add the questions before you can answer them (why not ask the questions in order and let me skip the ones that aren't relevant? I'll get back to this...), when you're in the session trying to answer questions, all the future questions are visible when you're answering one question which leads to overload, I have to click 'Add Entry' while highlighting the question to answer it (why can't I just click the question and start typing an answer and have it added after the question?). In general there's far too many clicks, mouse movements, and _tool_ thinking (as opposed to _task_ thinking) involved in using the application. I believe you should consider a simpler approach. Here's how I would like to see a brainstorming application like yours work: Instead of throwing everything at the user all at once and making them slog through a big list of questions choosing which questions to ask first, let them pick a broad area they want to drill down into (in the demo, let's say 'Expert Evaluator / Sample questions') and then go into a one-question-at-a-time dialog with the question at the top, and a text entry box below. Buttons 'Skip', and 'Next' prominently visible. If the question isn't relevant to my project, I skip. If it is, I fill in an answer and the question automatically goes to the session with the answer I gave. Think of it as Question flash cards with an Answer entry area. Now extrapolate that to the very first question; ask for an overview of the project as the first flash card. Then offer the list of modules, then start with the questions for that module. As it is, this product appears to present an unscalable wall of questions, which is the opposite of aiding brainstorming. Now if the application _does_ currently have a mode like that, it's not visible in any of the screenshots, videos, or in the demo at all. I am worried that you may be crucially limited by the MetaCard technology it's been built on top of; cross-platform toolkits are _notoriously_ hard to get right (as the author of a cross-platform app myself) and it's unfortunately not clear if the UI faults are the responsibility of the framework it's built atop. Even so, in the short period of time I've evaluated it, it presents itself as a SUPERB idea with what is CLEARLY a huge and deep amount of work put into it, collecting and winnowing down the questions, etc., but it's criminally hampered by the user interface and the interaction model it's been saddled with. I wouldn't have taken the time to write this long a note, and been this specific, if I wasn't passionate about what this _could_ become. I very much look forward to seeing where you take it in the future. No, none of your data flows back to us (aside from a SN confirmation and our updates we stream TO you). The remote databases aggregate content from many thousands of contributors daily, adding 12,000-15,000 new "thought particles" to the IdeaBrowser ever week. Very crisp thinking. I like it. Our development platform is Runtime Revolution, so very solid and clean in cross-platform application. We have a very long development horizon to help past IdeaFisher clients migrate TO ThoughtOffice, as well as MindManager/Mind Map clients engage without too steep a learning curve. As for the Topic Module display: It's always a challenge to handle that much content in an elegant way. In the current rev, we opted for speed over process in the end. 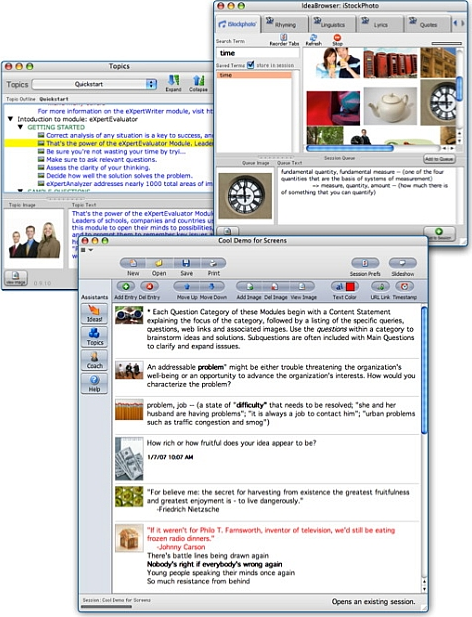 Each question can be selected from the upper panel and exposed in the lower panel, not too far from your described flashcard process (you can go to Preferences and set the font sizes and colors for each level of the outline, for better visual clarification of each questions and where it is in the grand scheme of things). When we interviewed leading domain experts, they almost all came back with a very natural 4-level hierarchy of Q&A. So we applied that to the Expert Topic Modules. When I am using the program, I first set the font sizes slightly larger in Prefs. Then I launch the Module of choice and click the Expand button (upper right). That gives me a clear view of ALL of the questions, and I can quickly scroll through and Shift-Select the ones I want to address - the one's that "Pop" for me. I usually find anything more than 20 is overkill, and slows the whole brainstorming process. Then I Add to Session and they all come in, in sequence, to my Session. ThoughtOffice marks each question used with a green checkmark to let you know it's already In Process. From there I take a quick glance at each questions, click in the one I want to tackle, and click the green (+) button to add my immediate answer. From there I either move to the next most valuable questions. Or I highlight a keyword and click the Ideas button and start the process of lateral thinking and association. Once I've addressed the majority (or all) of the questions in a Session, I play them back, one slide at a time, with the integrated Presenter. I may also print them as a visual outline to see them all at once. I agree with you that the process can get better. And we're committed to that. We're creating iOS/Android versions for smartphone and Pad, leveraging the more organic, pick and place approach those devices provide. And we're developing some very cool updates, upgrades and integrations with apps like Evernote and the Amazon S3 cloud, for very rich brainstorming that works as fast as you can pick or place or type or talk or video. Keep in touch. It's always good to find radical minds to challenge our ideas. Yes this helps. Thank you! Our next full upgrade, we're also providing an export to Wordpress, Blogger and Tumblr. Watch for that. Mark Effinger Thanks to the BitsduJour dudes and all of you incredible folks for another great opportunity to work together. We'll keep you posted as we release the new features and modules. If you have any questions, please drop by. And we'll be adding new content to both our ThoughtRod.com blog, and your download page. So keep your eyes peeled. Here's to your most excellent ideas coming to light. If you need help, are stuck on what you believe is a killer idea, please hit us up. We're always interested, and willing to make introductions, if it makes sense. Dave, Mark, Eric, Chipp and crew. I am really interested in the software but I cannot get the "Google images" tab to work in Idea browser. No matter what search term I use there is always this message that says "No images found for that term". I wonder what's wrong. Help is appreciated. Mark Effinger Hi, Robert. Dave Lockman here for Mark Effinger. The Google Images tab is a known issue. The tab is under reconstruction at the moment. We're modifying the Google agreement, and adding 2 additional image partners (ones that allow open distribution of the images under Creative Commons). In the interim, we're providing customers our 2000 image stock archive to use while we complete the update to v1.9. All customers - new and existing - can have access to this image library, and it's free for the asking. Hope that answers your question, Robert. Let us know if you need more info!